The course is based upon intense reading across a large field of literatures. With the intensification of increased urbanization and ecological crises, there has been an enormous academic production that has engaged with the notions of ‘urban ecology’ and ‘urban nature’. Some has been in the realm of basic science, some in the field sciences; other expressions has been towards policy—natural resource management and urban planning—and politics. Below is a selection and does not try to be comprehensive. However, there are structuring features of these literatures that the course strives to unpack, and every article is thus, in that sense, an example—or case study—of a larger field. Through getting familiar with this literature, we will touch and discuss the larger fields and strive to unpack what it is that makes them operate and ‘tick’. This will help all participants the better situate their own work in the literature, and get inspired, or provoked, by fields they knew less about before the course. What follows is a first set of readings that you can start with. The selection tries to find a balance between theoretical interventions, and case study research. This serves to sensitize the course to how theoretical statements are made, but also how empirical phenomenon are researched. The headings are provincial but gives a marker in which broad area of the literature they fit in. A couple of more headings will be added with some other literature. Also non-compulsory literature will be added later on. Most articles and chapters you can find in the course DropBox. I will continue adding as I have made scanned versions. The only book you really need to buy is Richard Walker’s (see below). But of course several are useful, for instance Cronon (1991) and Lachmund (2012). The articles are divided between ‘empirical engagements’ and ‘theoretical interventions’, which is, again, only a marker for things that works across these borders. But the point out a main thrust of the papers. All non-marked are compulsory reading. *Compulsory and part of reading for a lecture **Non-compulsory reading. As Science… To understand how the social practice of science tries to make sense of urban ecology as vegetation patterns, movement of species and as entire ecosystems. Lundberg, J., Andersson, E., Cleary, G., Elmqvist, T., 2008, Linkages beyond borders: targeting spatial processes in fragmented urban landscapes, Landscape Ecology 23(6):717-726. **Zipperer, W. C., Guntenspergen, G., 2009, Vegetation composition and structure of forest patches along urban-rural gradients, in: Ecologies of Cities and Towns: A Comparative Approach (M. J. McDonnell, A. K. Hahs, J. H. Breuste, eds. ), Cambridget University Press, Cambridge. …and as Systems Theory, NRM and SES… To understand how ‘field science’ is translated into policy and management ideas around urban ecology. Colding, J., Lundberg, J. and Folke, C. (2006) Incorporating green-area user groups in urban ecosystem management. Ambio 35(5) 237-244. Barthel, S., Folke, C., and Colding, J. (2010) Social-ecological memory in urban gardens—Retaining the capacity for management of ecosystem services. Global Environmental Change 20: 255-265. Karvonen, A., & Yocom, K. (2011). The civics of urban nature: enacting hybrid landscapes. Environment and Planning A, 43(6), 1305–1322. doi:10.1068/a43382 (* Connects with Hinchliffe and Whatmore but in a more straightforward way. Better situated in environmental history and UPE). *Evans, J. (2011) Resilience, ecology and adaptation in the experimental city. Transactions of the Institute of British Geographers 36: 223-37. *Evans, J. (2007) Wildlife corridors: an urban political ecology. Local Environment 12 (2) 129-152. *de Certeau, M. (1984) The Practice of Everyday Life, University of California Press, Berkeley. Chapter 7. Walking in the City. As History… To understand how historical methods and ways of structuring accounts and arguments brings a layered story to urban ecology. 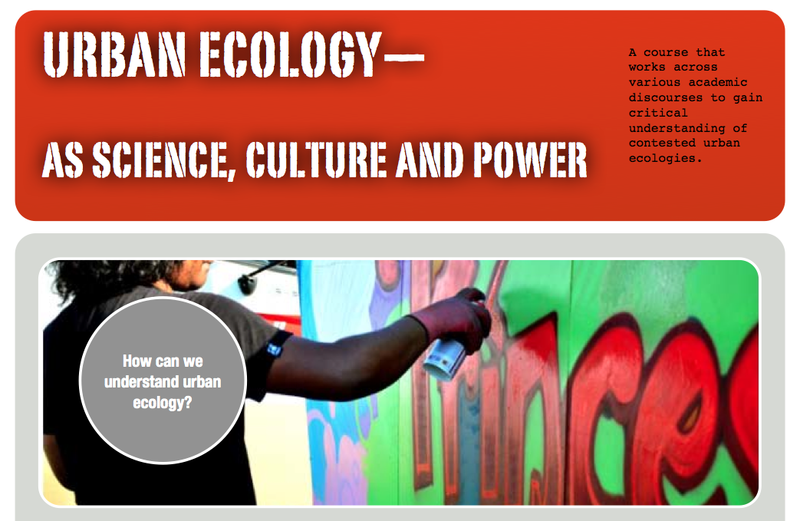 As Power… To understand how, in particular, critical geography and neo-Marxist thought have aimed to politicize urban ecology, its benefits and ills, and how it is known. Also often historical, but more explicitly driven by theoretical ideas. Swyngedouw, E. (1997). Power, nature and the city: The conquest of water and the political-ecology of urbanization in Guayaquil. Environment and Planning A, 29(2), 311–332. Swyngedouw, E. (1996). The City As a Hybrid: On Nature, Society and Cyborg Urbanization. Capitalism Nature Socialism, (April 2013), 37–41. **Kaika, M., & Swyngedouw, E. (2011). The Urbanization of Nature: Great Promises, Impasse, and New Beginnings. Blackwell Companion to Cities (pp. 96–107). Blackwell Publishing.